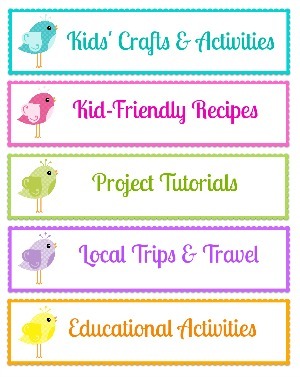 I saw THIS awesome idea at Frugal Family Fun Blog a few months ago and thought it was such a cool idea. The kids always love picking out paint swatches when we go to Home Depot, so the other day, I grabbed a bunch too. Then I just punched a hole in each card, attached a few cards with a piece of string and let the kids loose in the backyard to see who could find the best match. This little leaf might be the winner! The kids had a blast and we definitely plan on doing it again. My "big" kids had fun, but it would also be an awesome way to practice colors for even the littlest preschooler. 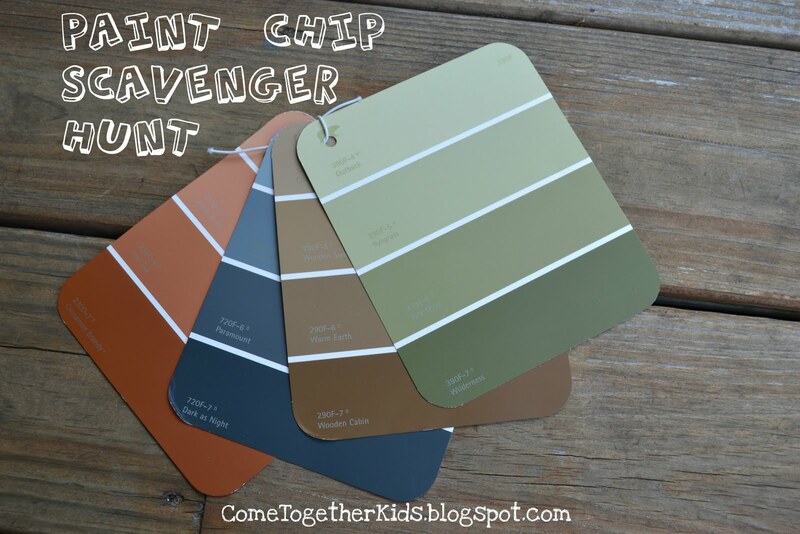 I chose earth tones this time because I planned on having them do it outdoors, but bright color swatches would be perfect for a playroom scavenger hunt or autumn hues would be great when the leaves start changing colors. I've been meaning to do this for a while now. Too hot outside so will probably have to do it inside. Love this. Use this idea alot. I make sure the paint department is one of our first stops at the store. Then we have a challenge to see who can find the most items that match their color while we're shopping. It keeps them occupied so that I can get my shopping done. I love it too! I actually was at the hardware store last week and picked up some swatches myself! I think she punched a hole in each color so that you could put it right up to the color! Such a fun idea! Super cute, easy, cheap and fun!! Thanks for the great idea! One of the paint companies makes chips in a leaf-like shape with holes already punched in them. They provide a ring for them to go on. We select fall leaf colors and use them on a fall nature walk. That is so crafty! I plan on picking a bunch of samples up now when I go to the store! lol :) Great tip! Hihi that's a fun idea. :) I must say they all found great color matches. Wanted to let you know that I have given you a blog award, because you rock! That's such a brilliant idea! I had to pin this. It's a fantastic idea. And doesn't cost anything. What a great idea! I would love it if you would stop by and share this at the crafty link party going on right now at Lines Across My Face. Hey I wanted to let you know that I featured this scavenger hunt on my blog today!! I can't wait to do it at my after-school program! I love this idea! 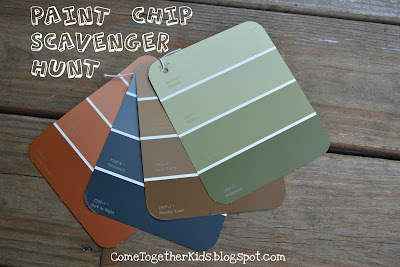 Great idea for a party or when you have a bunch of kids together who need a quick scavenger hunt! My daughter is just learning her colors, so she would like this for practice, too. This is a great idea! Looks like SO much fun! this is such a great idea! i love this! thank you for sharing such a fun idea! i am a new follower! That is a very clever game! What a great idea ... I don't have little kids, but I'll be sure to pass this along. Okay this is totally genius!!!! My four year old is going to be so excited. I think I will let him go pick out swatches with me and then we can come home and do the scavenger hunt. Thanks so much for sharing this great idea. This is a superb idea - I will definitely do this with my kiddos! First of all, so funny, the bleeding fire thing I used to say to my first graders ALL the time! AND I really love this idea. My 2 and 4 year old will have a blast with this one. Thanks So much for sharing! What a super fun idea! Sharing this on Facebook. LOVE this, love love love it!!! What a FUN game! I love love love this idea! Okay, clearly I am not the only one who loves this idea! And even better, it's easy on the budget! My daughter is still too young but I think I will put this together for when our friends' kids come to visit! 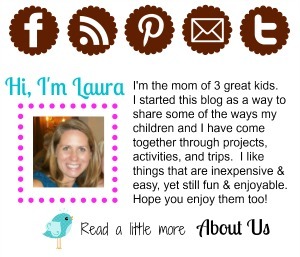 Good morning Laura, I featured this post at Happy Hour Projects! Thanks for linking it up at Freestyle Friday! Laura!! What an awesome share!! You were picked as one of my 3 favorite posts that Linked up to Mommy Club Wednesdays! I have linked to your blog from mine- hope it gives you extra traffic! Thanks so much for linking- and hope you will link up more awesome ideas in the future! HUGS! Sorry forgot to leave you the link to your feature! Thank you for sharing this idea. I mentioned it to a teacher friend of mine and she's all over it. I don't have any young kids, but I thought it was such a fun game that I featured it in my Get Me Motivated Monday post this week! I didn't find such an awesome posting till now.i am glad to read this. Facetime for pc is used for making free video calls. Vidmate for pc an best online movie watching app. Office.com/setup – Find out the easy steps for install, download, activation and re-installing the Microsoft office 365 & 2016 at www.office.com/setup. For more information please call at 800-368-7751. Office.com/setup has been developed for both Windows and Mac operating systems. This suite of applications is used for both personal and professional use. The latest version, Office setup 365 is booming among the businesses. For more information please call at +44-800-368-7751.